Sometimes I get really frustrated with Microsoft. They have a really great data-diagramming product with Visio, which they bought for the largest amount that they had ever paid for an acquisition at the time in 1999, but they have not succeeded in marketing the virtues of visual data to most of the Office community. I have always thought that one of the reasons for that is a misguided belief that you should not be able to make good use of Visio diagrams without purchasing Visio. My evidence for this is the lack of data, and sometimes hyperlinks, that are with each shape in the various outputs such as XPS, PDF, and Save As Web. For me, this is a missed opportunity because each of these formats could include data and multiple hyperlink support for each shape. Indeed, it should have been relatively simple for Microsoft to integrate Visio better with Word, Excel and PowerPoint … and I mean graphics and data, not just dumb pictures. Then there is the Microsoft Visio Viewer, which is an free ActiveX control that can be used to access all the shape data, hyperlinks and even supports layers. Granted that it is only supported on Windows PCs, but, what do Microsoft do? They include it as the Visio document previewer in Outlook, but emasculate it by hiding its ability to display the shape data and multiple hyperlinks. 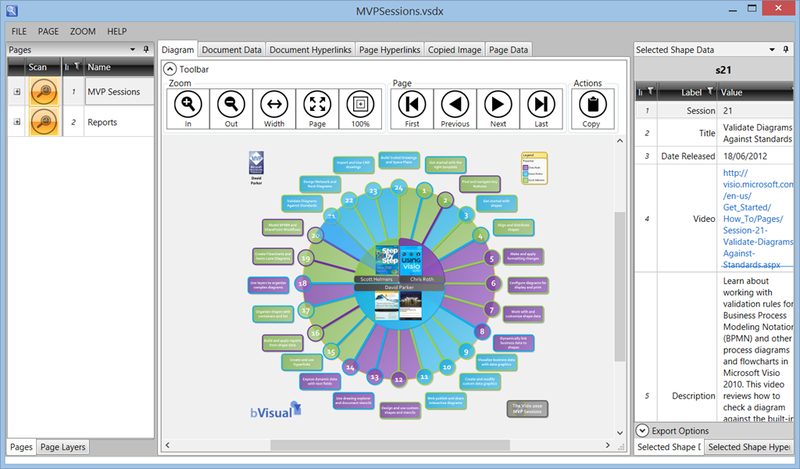 Therefore, I have been offering my visViewer application ( see http://bvisual.net/Products/visViewer.aspx ) for many years. 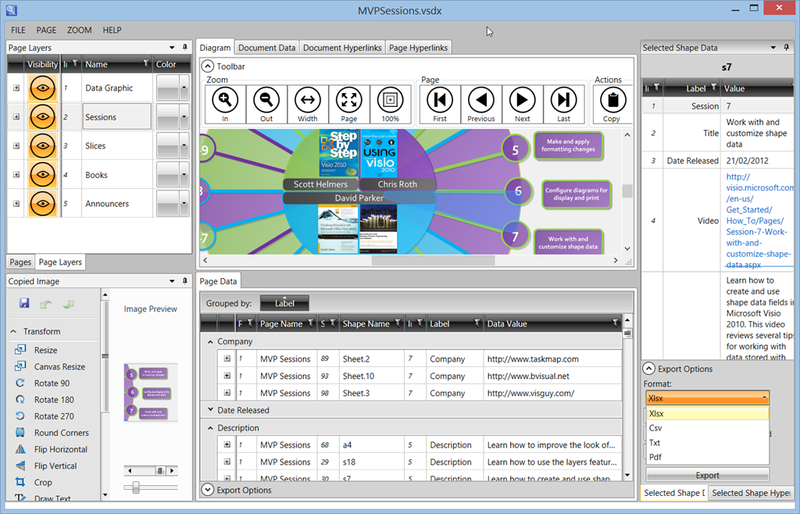 It wraps code around the Microsoft Visio Viewer, and allows the shape data and hyperlinks to be viewed, filtered, grouped and exported. I have now totally rewritten visViewer and made good use (i hope) of the Telerik WPF UI components that I get an MVP licence for. They saved me a lot of time. I have previously offered it free for non-commercial use, but, although I have had many, many downloads, very few people have actually bothered to pay. Thus, I have added licensing to this new edition, but the first 30 days are still free. The application should work for all 32-bit Office users on Windows 7+ (regardless of whether Windows is 32 or 64 bit), and can be used by Visio and non-Visio license holders alike. 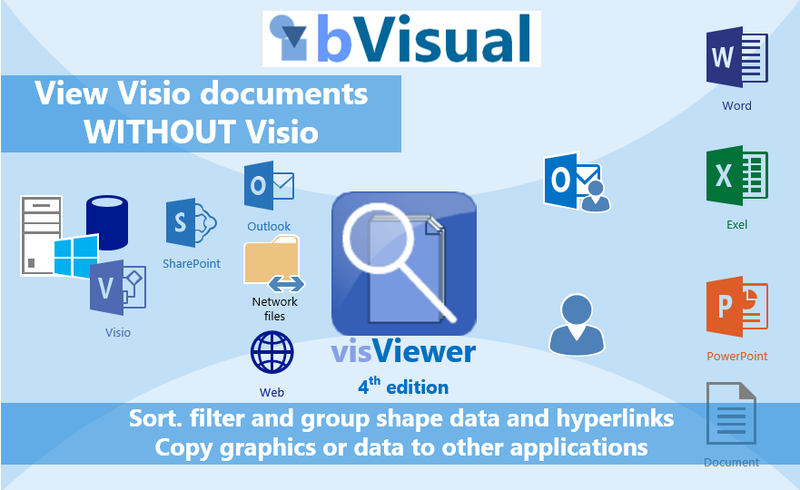 In fact, visViewer makes it simple to copy an image, data and hyperlinks from any part of a Visio document for use in any other application, such as Word, Excel or PowerPoint! I know that there is the Visio Web Access control for viewing Visio documents in SharePoint, and it does support displaying the shape data and multiple hyperlinks per shape, but you need to have a SharePoint to use it, and besides, Microsoft seem to be now promoting client-side applications for SharePoint rather than server-side controls.